The Trace tab allows one to set the color, size, and transparency of the tiles by the color or transparency of the objects (including bitmaps) that are placed under the location of the tiling. 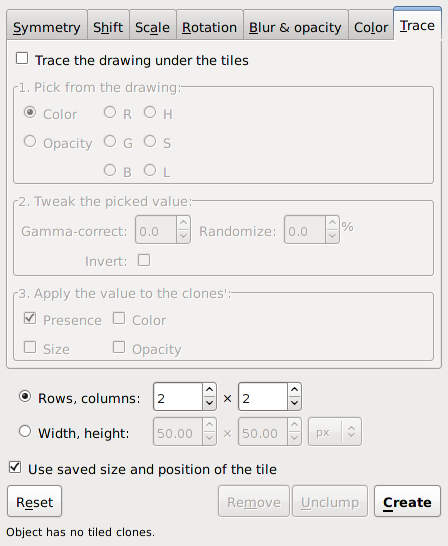 To enable this feature, the Trace the drawing under the tiles box must be checked. The Trace tab has three sections. At the top is a section for specifying what property of the underlying drawing should be used for input. Options include the color, one of the RGB components, or one of the HSL components. There is also the option to use the Opacity, which is the sum of the opacities (Alpha) of all objects under the tile. In the middle of the tab is a section to modify the input value. One can specify a Gamma correction or add a randomization factor to the input. One can also invert the input. The bottom section is for specifying what should be affected by the input. Options include Presence (the probability that a given tile will be drawn), color, size, and opacity. The color will only be changed for regions of the base tile that have Unset fill. The Trace tab of the Tile Clones dialog. The following figures show the effect of some of the possible combinations of input and output options. 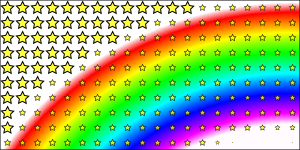 All the figures use the first rainbow figure as the input drawing. The rainbow is a radial gradient with multiple stops. 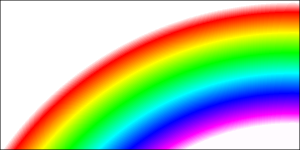 The inside of the rainbow is defined as a white gradient stop with zero Alpha. The last outside stop is defined with a red color and with zero Alpha. 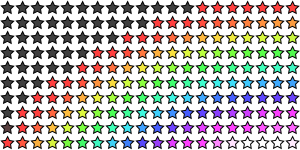 For most figures, a star inside an unfilled rectangle is used as the base tile. The star has been given an Unset fill when color is selected in the output. 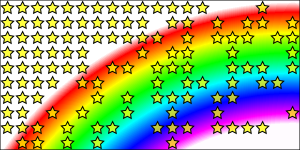 The rainbow pattern used for the background (a radial gradient). Input: Color. Output: Color. Background rainbow has been removed. Input: Hue. Output: Size. Note how the red has a hue of zero and purple has the maximum value. Input: Hue, inverted. Output: Color. 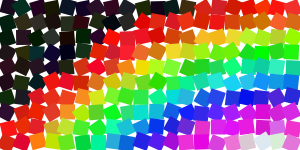 Input: Color, 10% random gamma. Output Color. Changes made to other tabs: Shift: random 10%, Rotation: random 20%. A square base tile with Unset fill has been used. The background rainbow has been deleted. 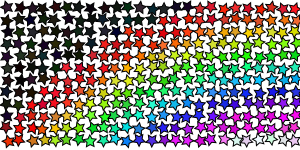 Input: Color, 10% random gamma. Output Color. Changes made to other tabs: Shift: −20%, random 10%, Rotation: random 20%. The number of rows and columns has been increased to compensate for the shift. The background rainbow has been deleted. See appendix for definition of Gamma.